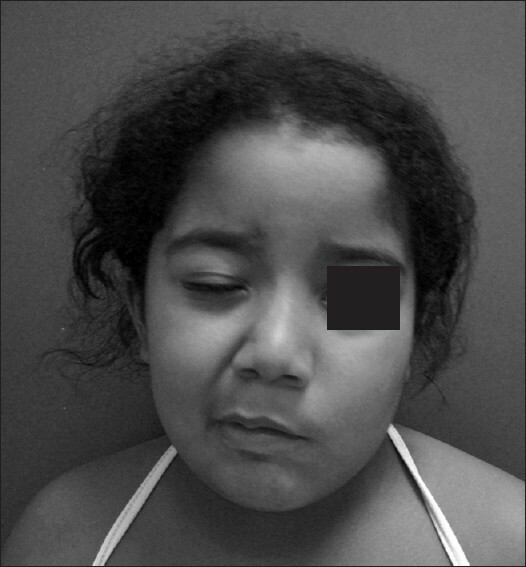 A 6-year-old girl without any significant past medical history was admitted with intermittent involuntary twitching of the right orbicular region; the twitching had occurred for 18 months. Over time, the spasms became more tonic, and after 4 months, the spasms also involved the right orbicularis oris area. The spasms could not be suppressed and were not associated with tension or anxiety. No other involuntary movements were observed. The patient had no hearing difficulties, dysphagia or hoarseness. Her early development and her neuropsychomotor acquisitions were normal. There was no family history of neurological diseases. Upon physical examination, she was noted to be in good overall condition, showing a normal physical examination without fever or any other signs of infection. Her height was 133 cm, and she weighed 39 kg, with a body mass index of 22.4. The neurological examination was noteworthy for dysarthria and right hemifacial spasm [Figure 1]. Fundoscopy examination was normal. Laboratory evaluations, including a complete blood cell count, electrolytes, blood urea nitrogen and liver enzymes were within the normal range. Cranial magnetic resonance imaging (MRI) revealed a right-sided heterogeneous lesion from the midbrain to the pons, extending to the cerebellopontine angle, with a slight mass effect on the fourth ventricle [Figure 2]. After the neuroimaging procedures, a cerebral biopsy was performed, which revealed a pilocytic astrocytoma. The hospital ethic commission approved this case report, and the patient's parents gave informed consent for publication. A variety of rare causes for hemifacial spasm occurring in childhood have been described. These causes include venous sinus thrombosis, masses of the fourth ventricle, pilocytic astrocytoma, congenital or acquired cholesteatoma, tuberculous meningitis, thickening of the arachnoid membrane, neurosurgical facial nerve injury, accommodative esotropia and mandibular prognathism. The present case describes a pilocytic astrocytoma located at the cerebellopontine angle. This case shows the importance of a thorough neurological evaluation because our patient presented with subtle clinical signs of hemifacial spasm as the initial manifestation of a pilocytic astrocytoma. Children who present with hemifacial spasm, even if very mild, should undergo further investigation. 1. Sandberg DI, Souweidane MM. 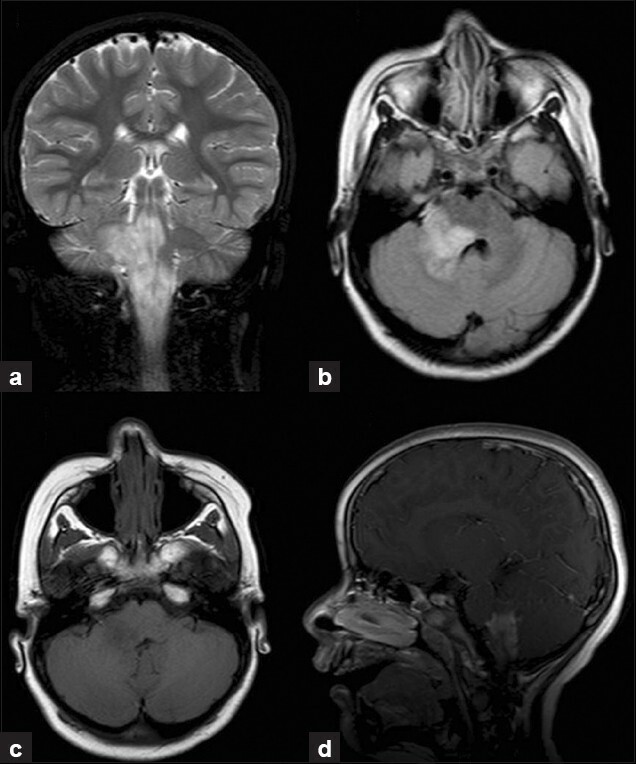 Hemifacial spasm caused by a pilocytic astrocytoma of the fourth ventricle. Pediatr Neurol 1999;21:754-6. 2. Wilkins RH. Hemifacial spasm: A review. Surg Neurol 1991;36:251-77. 3. Bills DC, Hanieh A. Hemifacial spasm in an infant due to fourth ventricular ganglioglioma. Case report. J Neurosurg 1991;75:134-7. 4. Sprik C, Wirtschafter JD. Hemifacial spasm due to intracranial tumor. An international survey of botulinum toxin investigators. Ophthalmology 1988;95:1042-5. 5. Langston JW, Tharp BR. Infantile hemifacial spasm. Arch Neurol 1976;33:302-3.